I would have prefered Richard Fisk. It was one of the ideas that came to the mind of Tom DeFalco. It never came to fruition in the comic book, Richard Fisk being revealed as the Rose instead (after Tom DeFalco left the book). 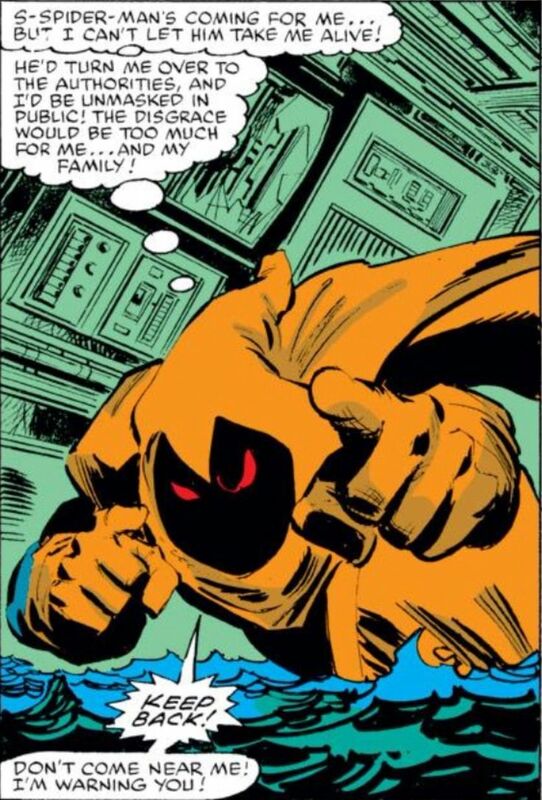 I think that Richard Fisk being Hobgoblin would have been an awesome idea. Since the Schemer story (his first appearance), it has been proven that Richard has combat skills and he knows how to use (& perhaps even build) high-tech weapons & vehicles. I can see Richard combining the Green Goblin costume & gadgets with the cloak & weapons of the Schemer to make the Hobgoblin's armory. From that point of view Richard Fisk makes a lot more sense than all other candidates given that AFAIK neither Ned Leeds nor Kingsley had ever shown talent for physical fighting. The best Ned managed to do was hit Peter Parker when he wasn't expecting it (back during Wolfman's run, when Betty cheated on Ned with Peter). I can also see Richard being worried that her mother might learn the truth about him. Here Ned and Richard both make more sense than Roderick, clearly being likely to worry about the reactions of, respectively, Betty Leeds and Vanessa Fisk, while the only family Roderick Kingsley was ever shown having was his brother Daniel, who was his accomplice (and thus after an unmasking of Roderick as the Hobgoblin would have had to worry more about being arrested and imprisoned himself than about being disgraced) and whom Roderick treated like dirt. I wonder how closely Stern actually read the issues by DeFalco at al. as he seems to have overlooked this. It would have been easy to insert e.g. a mother with a heart condition into Hobgoblin Lives!, but he never bothered to clear up that matter. Another thing which is rather odd is that the Hobgoblin addresses Mary Jane as "Miss Watson" in ASM #261 even though she apparently only started working for Kingsley ten issues later. That again was not explained by Stern but by fan theorizing. I didn't like Ned Leeds as the Hobgoblin (too crazy, too unstable and it ruined Leeds' reputation as a nice guy which he had earned since the Silver Age). Roger Stern probably had from the start the idea that Kingsley was the Hobgoblin. Roger Stern is an excellent writer but, in this case, he used one of the oldest threadbare tricks in fiction : two brothers, one impersonating the other when it is needed. Also, contrary to Fisk & Leeds, Kingsley was a recent character and almost a stranger to the reader. Especially as he had previously only appeared in PPSSM, the youngest Spider-Man title, and in storylines that were not all that memorable (who remembers Belladonna, the main villain of those stories?). But let's face it, the Hobgoblin mystery as envisaged by Stern fundamentally depended on Kingsley being a cipher about whom the readers at bottom knew (next to) nothing. So, well, Kingsley is cool but I would have prefered Richard Fisk. It would have been interesting if the new villain was revealed as the heir of two legacies of evil (the Osborns & the Fisks). Many years later after the Hobgoblin story, Richard was killed by his own mother. Still, I speculate that Vanessa might have actually killed Alfredo Morelli instead of Richard because the true Fisk Jr had already entered the Witness Protection Program just after he had been arrested as the Blood Rose. Nevertheless, even if my speculation is correct, it is far from certain that the "true" Richard Fisk might ever come back from the dead. This secondary character created by Stan Lee & John Romita Senior will probably stay in comics limbo a very long time.